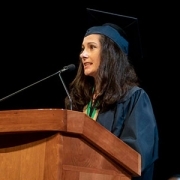 Laura Sanapo, M.D., M.S.H.S., told the graduating class that two guiding themes defined her experience as a GW student: diversity and momentum. 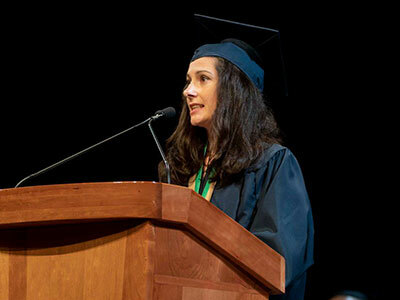 Laura Sanapo, M.D., M.S.H.S., a fetal medicine fellow at Children’s Fetal Medicine Institute, was named “Outstanding graduate student” at The George Washington University School of Medicine & Health Sciences (GWSMHS) and was among two student speakers to address fellow graduates during the ceremony held May 19, 2018. Prior to joining Children’s National Health System in 2014, Dr. Sanapo served with distinction at the University of Maryland School of Medicine and Thomas Jefferson University School of Medicine, conducting original research and frequently publishing in peer-reviewed journals. 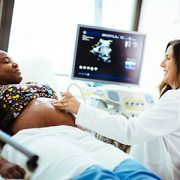 Under the mentorship of Adré J. du Plessis, M.B.Ch.B., M.P.H., chief of Children’s Division of Fetal and Transitional Medicine, Dr. Sanapo investigated the role of advanced ultrasound techniques in assessing fetal vasoreactivity in pregnancies complicated by such conditions as intrauterine growth restriction, Dr. Nasser wrote in the nomination letter. 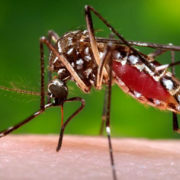 In that study, the research team is trying to better understand how a healthy fetus controls blood flow throughout the body, including to the lungs and brain. 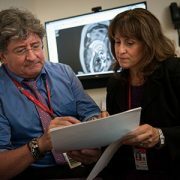 In addition to evaluating and counseling in high-risk pregnancies complicated by complex fetal malformations, Dr. Sanapo performed research and clinical ultrasounds daily. What’s more, Dr. Sanapo often scheduled appointments after-hours for patients unable to complete ultrasounds during normal business hours and was an integral part of the team that counseled women through difficult pregnancies. Dr. du Plessis notes that Dr. Sanapo has been a valued clinical leader at Children’s Fetal Medicine Institute, shepherding a multidisciplinary team that includes genetic counselors, specialists in maternal-fetal medicine, radiologists, pediatric neurologists and nurses. 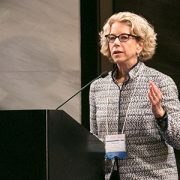 “When Children’s National and Inova announced a three-year, $2.8 million research and education collaboration in maternal, fetal and neonatal medicine last January, Laura’s contributions were pivotal in ensuring the research collaboration’s early success,” Dr. du Plessis adds.